albertnet: The Importance of Goals - Debunked! I’m often reminded how important it is to make goals. Specific, Measurable, Attainable, etc. But I don’t buy this. I’m not trying to say long-term goals are bad, or worthless … just that they may be overrated. So: maybe you haven’t achieved your goals in the past? Or can’t think of any now? I say don’t worry about it. The “running up and down the field and never score” platitude is clever, but really doesn’t apply here. Scoring in a game isn’t a goal per se, it’s the fundamental point of the activity. We need to differentiate between an immediate result that we seek vs. a lofty, distant vision of where we’d like to end up. Scoring in a football game means being in the moment, which is very different from vowing to make it into the NFL one day. For the same reason, achieving what you want “lightning fast” cannot possibly refer to the kind of goal that makes a life worthwhile. In the context of this post, and the wider context of goal-setting advice, I’m talking about long-term goals requiring organization, stepping stones, feedback, and such. Too much focus can keep you from highly productive dabbling. How can we discover what activities we really love without experimenting? If life balance is a key to happiness—which I happen to believe it is—couldn’t laser-like focus on a specific long-term goal be a bit problematic? You might ask this of the child of a workaholic, who wishes his parent would exchange that laser for a lamp or some nice area lighting. Our ability to set meaningful goals can be limited by our imagination, which is in turn limited by our life experience. What if we set the wrong goals? Goal setting doesn’t necessarily “give clarity on end vision.” Often the extent of what we can achieve isn’t clear until we’ve done it. Many goals cannot be met by one person acting alone, and yet for most of us, who aren’t managers or quarterbacks or platoon leaders, it’s all but impossible to charter a course for others that is aligned with our own goals. It’s just as likely we’ll (help to) achieve great things by attaching ourselves, or being attached, to some larger goal we didn’t think up. Not having a specific goal is often equated with laziness or inactivity, which I think is inaccurate. A solid work ethic can thrive with or without a specific expectation of what the hard work may eventually lead to. This approach may provide particularly fertile ground for taking advantage of unexpected opportunities. For decades I’ve assumed that I’m alone in eschewing goal-setting. And yet, I don’t often see real-life examples of its benefits. So before embarking on this exploration, I chatted about it with a couple of persons close to me. 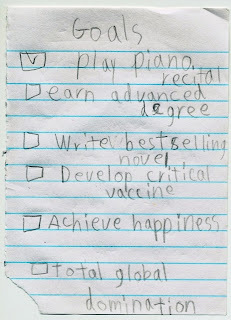 First, I asked my sixth-grade daughter if she has set any goals lately. (I know, she’s a little young to be looked to as a guru on such matters, but I do consider her a powerful individual.) She described how, on the first day of school, her teacher had each student draw two lines across a post-it to divide it into quarters, and then had them write down a goal in each, to be achieved (or at least attempted) by the end of the school year. 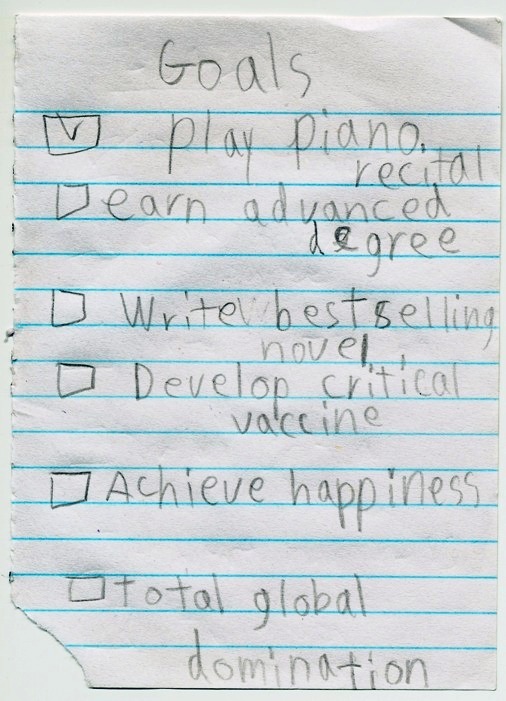 He assigned four categories: school, extra-curricular, family, and planet. Alexa wrote “straight As,” “first stand in violin,” “fight less with my sister,” and “recycle more,” respectively. “Now, is fighting less with your sister really a goal?” I went on. (This is more of a practice, in my book.) “Not really a goal … maybe more like just behaving better,” she replied. I asked if she recycled every recyclable item she could already, and she rolled her eyes. “Yeah, but what else was I going to put?” she asked. I moved on to the “first stand in violin” goal. After she explained what this meant (I still don’t understand it completely), I said, “That sounds like a good, solid, challenging goal for this year.” She said, “Well, it actually doesn’t have that much to do with my playing.” She described how her friend, a first violinist whom she’s assigned to sit next to, is vying for first stand, and if this friend makes it, my daughter will simply ride her coattails (according to the standard seating practice of the orchestra). Other than hoping her friend succeeds, and continuing to practice her own playing, she contends, she doesn’t have much influence on her fate. So this goal , too, doesn’t quite fit the classic goal-setting model. In first grade, we did a big unit on careers. Various parents came in to talk about theirs. (Oddly, the only one I remember well was a long-haul truck driver.) Then we kids had to decide what we were going to be when we grew up, and draw a picture of ourselves on the job. The year before, my brother Max had chosen “ambulance driver,” mainly (I believed then, and continue to believe) because he thought he could draw a pretty cool picture of an ambulance. My parents were pleased at his choice and made a nice fuss over him. When it was my turn, I thought about the project for about thirty seconds before deciding I could probably draw a TV set, and that it would be fun to draw a TV showroom with not only a few TVs in it, but also a big picture window, out of which you could see the street and a cyclist riding by. I thought it would be a nice challenge to draw this well enough for the window not just to look like another TV. So I chose the career goal of TV salesman. I tried to explain myself, but couldn’t articulate my position. It was as though, at age six, I’d signed a contract and my future was set in stone. So all that this goal achieved was to make me feel bad about myself, and make my parents feel bad about me (and perhaps feel bad about themselves). All this, just because I followed my natural inclination, which was to work hard on the present activity and let the future take care of itself. As it turns out, I’ve never really abandoned this approach, and yet I don’t actually sell TVs for a living today. And I think it’s worth pointing out that the field I work in now didn’t even exist in 1975 when TV-Gate went down. In college I chose English as a major. This isn’t the same thing as setting a goal, really: you have to declare something, after all. But a college major and a career goal can be interrelated. Choosing English is different than going for something practical like Engineering, which naturally equips you for a specific career. With my choice I was making a statement: that I didn’t know what I wanted to be when I grew up, and I didn’t care what prospects my major may or may not present me with. This bothered some people. It bothered my dad, for example. And it led to people bothering me. “English?” they’d say. “What are you going to do with that?” I got so sick of hearing that. You know who didn’t ask me that? The companies that ultimately hired me. I did get to ask this kind of question, though, in the late ‘90s when I was interviewing a candidate for a job where I worked. Perusing his résumé, I said, “Double major in Philosophy and Political Science, huh? What makes you think that will serve you in an engineering job?” (I was half-joking, but also seeing how well he did under pressure.) He replied, “Well, it’ll make me a more interesting colleague.” Right answer! We’ve been working together for over fifteen years now. What if I’d created a long-term career goal and then, with laser focus, selected a major that would help get me there? Would that have given me “clarity on the end vision”? Probably not, given the way industries have changed since my college days. But I might have decided English wasn’t a “safe” major, and done something else—and that would be a shame, because I enjoyed my liberal arts education and am glad I got it. In college, I rode for the cycling team. I had never had any long-term goals in bike racing; I just rode and raced as much as my schedule would allow, got what coaching I could, and suffered a lot. I certainly never expected to be recognized for my overall efforts in the sport. I was taken by surprise, therefore, when I won the UC Santa Barbara Club Sports Top Scholar Athlete award. I didn’t even know there was such an award. Had I known about it, and had I set a goal of winning it, would I have behaved any differently? No: getting good grades and racing my bike were standard practices for me, not a means to any end. 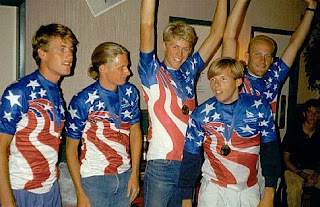 The next year, our team won the gold medal in the National Championship Team Time Trial event. I guess I could retroactively pretend that this had been an achievement years in the making. But really, it wasn’t. Sure, when we headed to Nationals we were aiming to win, but TTT victory wasn’t a goal we’d written on a piece of paper at the beginning of the season and worked out a strategy to fulfill. Nationals wasn’t really different than any other TTT that we’d ever ridden. It’s a race, and the whole team goes all-out the whole time, just like every other team. I think it’s important to note that it took me five years of losing bike races before I got any decent results. If anything, setting big goals year by year would have been a demoralizing endeavor. Had I set a goal to win a race, I probably would have set my horizon at two or three years tops, and then been let down when I failed. The success I ultimately had has a lot to do with my approach, which was to do the best I could, keep at it, and hope for the best, year after year. It’s easier to be patient, I think, when you’re not officially failing in your goals. More than seventeen years ago I interviewed extensively for the job I still have. I’d started out interviewing for one position, and failed to get it, but was asked if I’d consider a totally different position that the company thought would better suit me. That was just fine, since I hadn’t had a specific goal in the first place, other than to work for this particular company. So when it came time for the man who would be my boss to ask the classic interview question—“Where do you see yourself in five years?”—I was in a bit of a bind. If the phrase “family goals” causes you to snort or snicker, good. Given how complicated family life is, it would be kind of amazing if everybody could agree on any goal, much less cooperate to fulfill it. I’m not saying families are lame or anything; on the contrary, my greatest satisfaction comes from mine. It’s just that having this rich family life doesn’t represent the achievement of any goal I could ever have set. Again, I’m not telling you not to set big goals and strive to achieve them. Maybe I’d have a better and/or more important life if I did this myself. What I am saying is that if, like me, you’ve gone through life ignoring all the conventional goal-setting wisdom, and this has bothered you, perhaps you can stop worrying. My philosophy has been something like “Okay, life, I’ll throw everything I’ve got at you, and in return … well, surprise me.” That’s worked out okay so far. I just came across a great quote in an article about parenting in the NY Times: "A Dutch father of three told me about his Buddhist-inspired approach: total commitment to the process, total equanimity about the outcome." I love it.